Today we proudly introduce the new feature on AKUN personal online accounting: e-Invoice. You will see this “e-Invoice” link under Tools group menu in our apps. e-Invoice is online tool for creating Invoice in PDF file format. You can download then print it. You can also directly send it as email attachment to your customers. 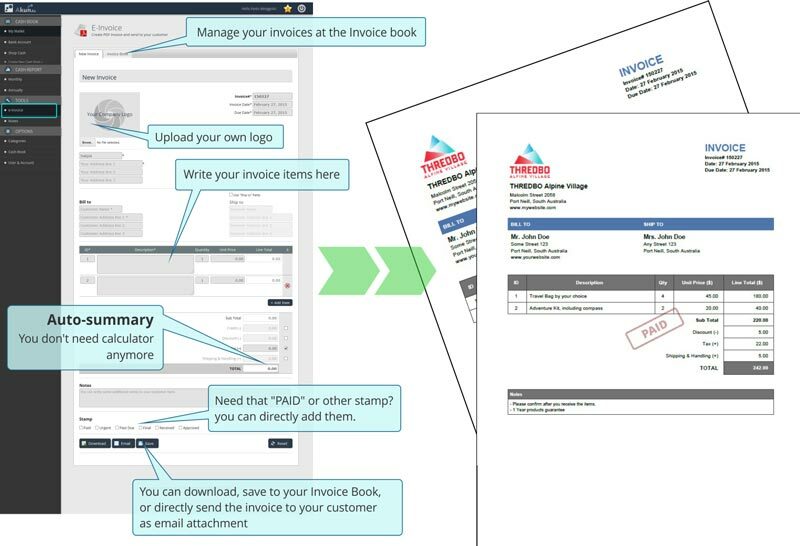 We also provide the Invoice Book to keep and manage all your invoices that has been made before. Anyway, we still working to make this tools better for you. If you have any idea to enhance this online invoice tools, please let us now by sending your feedback via Contact Page. I truly wanted too develop a quick comment to be able to say thanks to you for the superb app are sharing here. My time consuming internet research has now been paid with extremely. I very much lucky to have used the website and your cash book service. Bagaimana cara upload foto logo perusahaan di e-Invoice. Kenapa di page saya tidak keluar tombol uploadnya. Apakah harus upgrade ke premium terlebih dahulu? Iya pak 🙂 fasilitas tersebut hanya tersedia untuk pengguna premium. apakah dalam pembuatan invoice sudah bisa di setting harga modal dari item yang terjual ? sehingga dari invoice yang terbit sudah terlihat jumlah keuntungan. Kami belum begitu paham maksud pertanyaan dari Anda. Mohon dijelaskan lebih rigid.